Aloha Future NCA Newbie! Interested in Trying Something New? Over the last few years, we have had more than a hundred newbies try out Outrigging with the NCA club. We hope you give this awesome and unique sport a try! Great Workout: Chance to build your core muscles, including legs, stomach, back, shoulders, and arms! Variety: Break up a monotonous workout routine! Guidance from most workout gurus suggest that one should vary their workout as much as possible to develop your strength and endurance and to prevent injuries. Try for Free: Yep, you heard that right! Our novices aren't asked to pay anything until they join, so give Outrigging a shot risk free for up to 3 practices! Viewpoint: See DC from a different view, the water! 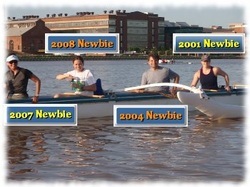 Plus you can brag to your friends about actually trying a cool new team sport that lets you paddle around DC! Have Fun: If you can't have fun while working out, then give this a shot! If you have any questions, or would like to check out the NCA Outrigging club, give this sport a try, come on down! You can contact us if you have any questions! Mahalo! Look forward to seeing you on the water! NCAWPA Outrigger Best of 2008 from Susanita on Vimeo.